Have you ever heard the phrase, “too much of a good thing”? You probably have and Smart probably has too, but that doesn’t mean he kept it in mind all of the time. The tidbits about neuroscience when they matched up with the benefits of slacking were interesting and well said. Likewise, Smart’s interest in Rilke had, so far at least, proved an interesting (if not slightly tangential) look at how people can enjoy their lives by living alongside the noise and still embrace slacking. Chapter 7 decides to throw these two interests (neuroscience and Rilke) and bring them up to 11. Rilke is mentioned sporadically throughout the chapter as a sort of gateway to the central point that noise is important for our brains and not as damaging as most people say. These are good points, but only in moderation. These notes about neuroscience and the benefits of noise were, themselves, good background noise for Smart’s main point about slacking. But put to the center in this chapter Smart spends almost all of it elaborating on noise within the neuroscientific community, an explanation that seems startlingly at odds with the rest of the “pop” science vibe established so far. I know it sounds like I was criticizing Smart before for not being thorough enough and this time for being overly thorough, but that’s not my real issue. My issue is that Smart is being overly thorough on an unimportant (relatively speaking) side-point that doesn’t need entire sections dedicated to it. And that’s mainly because Smart has already, in previous chapters, established clearly that our society undervalues noise that is created by us. He’s already established that this has relation to slacking and he has explained in the simplest and accessible terms why all of this is the case. So the chapter comes off as entirely unnecessary. It also strikes me that saying “noise is a good thing” while dedicating your book to the subject of slacking seems a bit paradoxical and counter-intuitive. Who has ever heard of a noisy slacker? Isn’t slacking the sort of activity that would ultimately reduce the amount of noise around you, whether in your brain or outside of your body? At one point in the chapter, Smart just starts talking about graphs and the Earth and its relation to noise. And it’s at parts like this in the chapter where you have to wonder why did Smart stray so far from the original topic. I’m not suggesting (or mean to suggest) that the topic of noise has nothing to do with slacking. But the title of the book (or at least the sub-title) is The Art of Doing Nothing and, last I checked, doing nothing doesn’t require a lot of noise. As far as the points about noise go, it isn’t like I found them particularly bad or unpersuasive. They were just uninteresting and, at certain points, worthy of eye-rolls. Why is Smart going on and on about a subject that should only be tangentially (at best) brought up in a book about doing nothing? I understand that neuroscience is an important part of this book for Smart, but that doesn’t mean he has to go into detail about one of his pet interests. The chapter just strikes me as a neuroscientist using a book on one topic to nerd out about a side topic that he’s really into but only holds the smallest bit of relevance to the original topic at hand. And the other parts of this chapter are little better, with tangents about how noise can specifically help folks with ADD. Now, as someone with ADHD, I found this part of the chapter interesting. But that’s because I’m a person with ADHD and obviously not everyone reading this book is going to find that subject as personal as I did. A book should not have to rely on the personal idiosyncrasies of a given reader so that it can be enjoyed. Ideally, a book should stand on its own merits and be appreciated in general for its writing and its ability to, you know, stay on topic. Just for the sake of taking out the mystery: I enjoyed this section of the book because noise really does help my ADHD. I think it’s partially why I enjoy such chaotic music like Giraffes? Giraffes! (which I’m listening to right now). It helps keep me focused in a weird way as Smart suggests via the research he’s familiar with on ADHD children and ambient music. On the subject of ADD, Smart actually makes a somewhat alarming claim that perhaps ADD owes its recent increase more to economic and political machinations than anything else. But this is similar to claims about autism being on “the rise” because of vaccines and other pseudoscience that the left can sometimes propagate. The reason why (at least in part) diagnoses like ADD have been rising is because doctors are getting much better at recognizing it in children. I don’t doubt that economic and political aspects of the society around them affect children in some ways, but I get nervous with putting too much emphasis on these factors. Ultimately ADD occurs not because children aren’t being treated fairly or because the pharmaceutical industry profits from it. ADD is (as autism is) a largely genetic phenomenon within the structure of the brain and has historically been ignored and under-diagnosed, only recently has this changed. 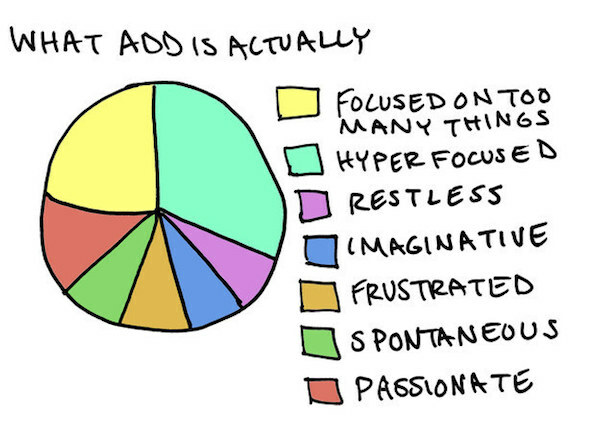 There’s more to say about ADHD but it’s hardly worth commenting on, here or in this chapter. In an ironic way this chapter itself reminds me of someone with ADD. It’s passionate, unfocused and ultimately tangential to the larger context it attempts to place itself in. And while I’m sympathetic to such a chapter, it doesn’t make for good reading.